Blizzard of 2016 live blog: Winter snow storm updates. 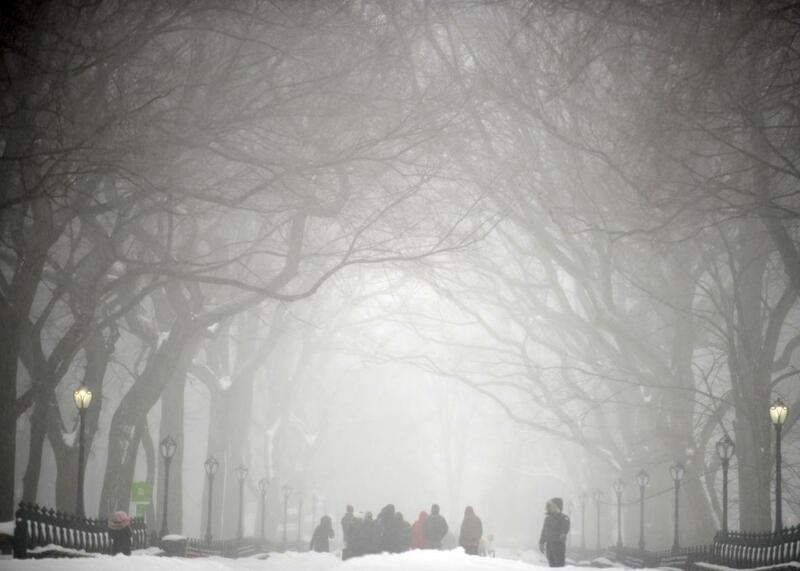 Visitors stroll through Central Park on Jan. 23, 2016 in New York City—the city’s snowiest day in history. 10:30 p.m. ET: And that’s a wrap! Thanks for following along, everybody. Enjoy Sunday’s snowball fights! 10:00 p.m. ET: As this historic snowstorm winds to a close, there’s meteorological scandal afoot in the D.C. area. The Washington Post’s Capital Weather Gang reports the city’s official snowfall observations, taken across the Potomac River by FAA contractors at National Airport, may have been conducted improperly. The issue is that a snow board, which helps provide a more accurate measurement, was not used—even though it is required by NWS guidelines. Jordan Tessler, a D.C.–area meteorologist, conducted a quick analysis arguing that D.C.’s official snow total should be more like 19.5 inches rather than the 17.8 that tentatively was measured. While that may not seem like a huge difference, it would move this storm into third place in D.C. history—up from the current No. 4 ranking. Things like this matter to die-hard weather nerds, and also to the historical record city officials use for planning for future storms. The Weather Channel reports the National Weather Service has “retracted” the measurement in question—which will likely be examined by the National Weather Service in more detail, and possibly adjusted. 7:50 p.m. ET: Oh yeah, and it’s official now: This is the snowiest day in New York City history. 7:30 p.m. ET: We’re closing in on the final hours of the Blizzard of 2016. The latest numbers, as of 7 p.m., along with their new all-time snowstorm rankings: 26 inches in Baltimore (3rd), 25.1 inches at Central Park in NYC (3rd), 20.8 inches in Philadelphia (6th), and 17.8 inches at National Airport in D.C. (exactly tying the 2010 Snowmageddon storm for 4th place)—though there’s 28.3 inches at Dulles Airport (2nd all-time) just west of D.C., which might be more representative of the suburbs there. 7:30 p.m. ET: About a half hour away from the evening high tide in New York City, and it doesn’t appear that water levels will top Saturday morning’s high tide. Great news. 6:50 p.m. ET: A technical discussion from the National Weather Service says that snowfall rates from D.C. to NYC to southern Massachusetts will “slowly diminish” through midnight, but isolated bands may continue producing 1 to 2 inches of snow per hour during that time. One such band is currently camped out directly over New York City, where the snow may not totally stop for another 10 hours or so. 6:00 p.m. ET: This is already, or will very soon become, the biggest one-day snowfall total on record in New York City. Two hours ago, Central Park had 19.3 inches but hasn’t reported since (which is normal). As of 6 p.m., JFK airport has recorded a stunning 26 inches—surpassing its single-day record of 21.6 inches set during the Presidents Day storm of February 2003. The snow is falling at an exceedingly heavy two inches per hour rate in the city, and shows no immediate signs of lessening. These records are slightly different than the snowstorm records, which cover a three-day period. NYC’s single snowstorm record is 26.9 inches set in February 2010—which this storm is currently on pace to break. 5:40 p.m. ET: For the time being, it looks like New York City has surpassed Washington, D.C.’s snow total—at least according to official measurements. As of 4 p.m., there’s 19.3 inches of snow at Central Park in NYC, and at 5 p.m. there was 17.5 inches at National Airport in D.C. NWS forecasters in NYC are expecting another 6 or 7 inches, and D.C. is expecting at least another 2 or 3. 2:45 p.m. ET: As we move past the afternoon low tide, there’s fresh concern for afternoon coastal flooding during the next high tide—even in New York City. I’ve been tweeting with Adam Sobel, the Columbia University professor who literally wrote the book on Sandy’s flood, and he’s thinking the afternoon high tide may create top-10 all-time coastal water levels in New York Harbor, close to levels reached during Hurricane Irene in 2011. This won’t be anywhere close to Sandy levels—that can’t be stressed enough—but especially low-lying parts of the city like JFK airport and some sea walls in Manhattan and Brooklyn may be overtopped. During Irene, then-Mayor Michael Bloomberg famously closed the entire subway system, the first time that had ever happened. In a post-storm analysis, it was discovered that water levels came within a foot of flooding the subways, which of course actually happened just the next year during Sandy. 2:30 p.m. ET: New York City roads are now completely closed to nonemergency traffic. As the city hunkers down, the snow totals continue to rack up. At 1 p.m., there was 16.5 inches in Newark, N.J., 16.2 inches at LaGuardia Airport in Queens and 14.7 inches in Central Park. Meanwhile, after a midday lull, Washington, D.C.’s official total now stands at 14.9 inches, though nearly twice that has been measured in the surrounding suburbs. 12:50 p.m. ET: New York Gov. Andrew Cuomo has announced a travel ban in New York City, effective at 2:30 p.m. Saturday. All city roads will close to civilian traffic, including buses, and elevated subways will close at 4 p.m. as well. All Broadway shows will also be canceled Saturday. 12:45 p.m. ET: One of the oldest cities in America, Lewes, Delaware, recorded its worst coastal flood in history Saturday morning in association with this blizzard. There’s a bulletproof direct link to climate change here: Sea levels in Lewes have risen by more than a foot over the last 100 years, meaning this flood would not have been as bad if not for global warming. 11:55 a.m. ET: At a midday press conference, New York City mayor Bill de Blasio said the city was considering a total travel ban in response to the recently boosted snowfall forecast. “Anyone who’s come into the city from the suburbs should turn around and go back. This is very, very fast accumulation, and I guarantee if people linger they will get stuck,” he said. New York Gov. Andrew Cuomo has also declared a state of emergency for the region. 11:20 a.m. 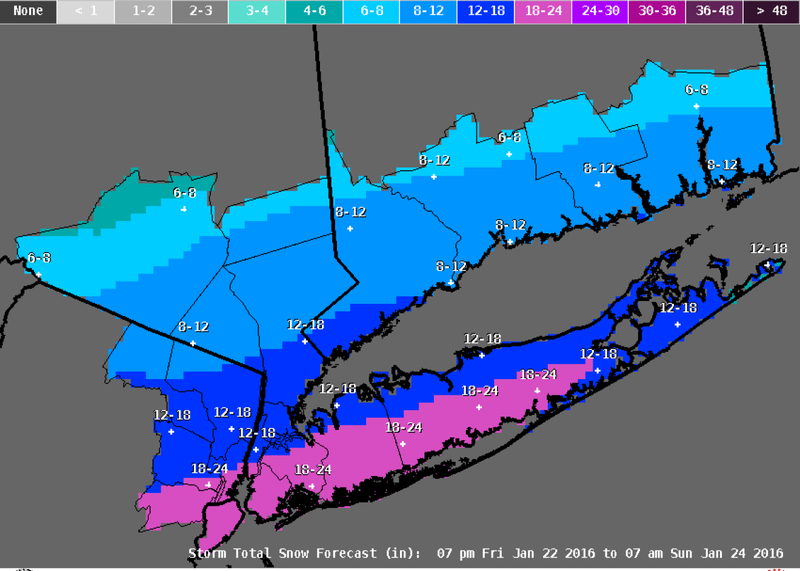 ET: Just as I posted the update below, the National Weather Service in NYC greatly boosted their snow total forecast. A whopping 24-30 inches is now expected in Central Park, where the city’s official snow records are kept. At the top end, that would mean this blizzard would become the single snowiest since those records began, in 1869. Storm total projected snowfall from the National Weather Service for the New York City area, as of Saturday’s midday update. 10:55 a.m. ET: This blizzard is just now hitting its stride, the National Weather Service has warned in a technical forecast discussion. They’re calling for a period of up to 2 inch per hour snowfall from D.C. to Baltimore to Philadelphia to NYC to southern Connecticut through midday “and beyond.” Just across the Hudson River from New York City, parts of New Jersey have already hit the one foot mark, with about 20 hours of snow left to go. This storm may now challenge New York City’s biggest single snowfall on record, 26.9 inches in February 2006. In a separate forecast discussion, the NWS in NYC warns that weather models continue to indicate significantly more snow than their relatively conservative forecast (below) shows. Storm total projected snowfall from the National Weather Service for the New York City area, as of Saturday morning’s update. 10:10 a.m. ET: Sure, an astronaut tweeting from space is pretty cool, but astronaut tweeting a picture of THUNDERSNOW from space?! You, sir, just won the Internet forever. Update, 10:18 a.m.: Of course, the omniscient Capital Weather Gang at the Washington Post immediately points out that the lightning in Scott Kelly’s image from the space station was probably in a regular rain-making thunderstorm out over the ocean. They’re right, but I refuse to lose hope. 9:15 a.m. ET: It’s majorly blizzarding in New York City right now, but meanwhile, just 50 miles north—there’s nary a flake in the sky. This time Friday, forecasters were still torn on how far north the sharp northern cutoff of this storm would reach. We now have the answer. 8:20 a.m. ET: A roundup of impacts so far: In Kentucky, the Associated Press reports the Red Cross is providing aid to a group of perhaps “thousands” of motorists stranded in a massive 35-mile–long traffic jam on I-75 for as much as 10 hours overnight. The National Guard and Kentucky State Police are working to clear the jam, south of Lexington, one car at a time. Also, tens of thousands of people are without power in New Jersey, and a spokesperson for the Virginia State Police says officers have responded to 989 crashes and 793 disabled vehicles so far across that state. CNN reports that 11 states have declared a state of emergency. 7:30 a.m. ET: This storm is really hitting its stride in the New York City area, too—and much earlier than expected: There’s already six inches on the ground in Central Park as of 7 am, according to official measurements. It’ll snow like this for the next 24 hours there. 7:20 a.m. ET: The snow is really starting to pile up in the D.C. area. There’s about 12-18 inches on the ground right now, almost half of that just within the last 4 or 5 hours. At National Airport, D.C.’s official snow measuring site, there’s 14 inches—good enough for the city’s 12th biggest snowstorm in history, and this storm is probably only half over. 7:00 a.m. ET: Thundersnow! Slate’s science editor Laura Helmuth has spotted that most joyous of all meteorological phenomena at her home in the D.C. area, and she wasn’t the only one. She says: “We had some tremendous thundersnow this morning at about 6 a.m. in Rockville. Bright flash, extremely long-lasting thunder peal.” Awww, yeah. There’s some real science at work here too: Thundersnow is an indicator of extremely heavy snowfall rates. Thundersnow with lightning. Hurricane force winds with flood warnings in Ocean City. When the last time y'all read your bible. Get right. 11:30 p.m. ET: Overnight weather models are in, and once again, they’re showing the storm pushing further north than previously expected. This trend, as well as the storm’s stronger-than-expected showing so far—parts of the D.C. area already have 10 inches!—have prompted the NWS forecasters in New York City to go all in. Here’s what I’m thinking for the rest of the storm: For D.C., an additional 15-20 inches—which would challenge the city’s all-time snowfall record. This is a crippling amount of snow, and it will probably take days for the city to get moving again. Baltimore and Philadelphia should also wind up with a 20-25 inch storm total. New York City, which was expecting just 5-10 inches this morning, should now prepare for 18-24, ranking among the city’s five worst snowstorms since the Civil War. Saturday from 8 a.m. to midnight will be the storm’s peak, with heaviest snowfall rates, strongest winds (with gusts up to 50 mph), and most blizzard-y conditions. Don’t be afraid to ask your neighbors for help if you’re caught off-guard by the sudden boost in the forecast. In my six years in New York City, big snowstorms were an amazing, magical time. Enjoy it, and stay safe. 9:00 p.m. ET: This blizzard, whatever you want to call it—#Blizzard2016, #Snowzilla, or #DavidSnowie—is still about a day or so away from peak strength. It’s been wow’ing meteorologists for days via computer model projections, and now it’s wow’ing them with spectacular satellite images like the one below. 8:10 p.m. ET: This week, Slate collected some fabulous reader questions about the impending megablizzard. While we have a few minutes, I wanted to share my favorite that was left on the editor’s chopping block: Just how big of a snowball fight could we have with the snow this thing is going to dump on the east coasters? Is there enough for everyone in the country to have say, 10 snowballs, which would probably be the minimum acceptable level for a true fight? Here’s my answer: Let’s see, there are 320 million people in the USA, and the snow will fall over about 100,000 square miles at an average depth of, let’s say, 10 inches. There are about 4 billion square inches in a square mile, which means the total amount of snow will be about 4 quadrillion cubic inches of snow. That means each American gets about 12,000,000 cubic inches of snow, enough for about 7,000 snowballs for every man, woman, and child in the country. This doesn’t factor in the inevitable melt during the transportation and distribution process, so you’re on your own to figure out how that part’s going to work. But basically, yes. 7:30 p.m. ET: Snow has been falling for about eight hours in D.C. now, and streets are beginning to resemble winter wonderlands. The National Weather Service says snow should fall at up to one inch per hour during the evening hours before picking up overnight. 7:30 p.m. ET: The Associated Press is reporting that at least eight people have died in weather-related incidents so far in the blizzard in Kentucky, North Carolina, and Tennessee. 7:10 p.m. ET: While folks in Washington, D.C. and points northward anticipate the Big One, meteorological fireworks are already flying down in Charlotte, N.C. where a major ice storm is underway. Power outages are already piling up across the Carolinas, and the video below is a great example of why. The last gasp of power in Oakwood. 5:20 p.m. ET: If, like me, you’re weirdly obsessed—already! !—with checking how much snow is piling up in your neighborhood and are too lazy/cold to go outside and check the sidewalk yourself, the National Weather Service will be issuing reports about once every two hours throughout the duration of the storm compiling reports from people that are brave enough to take their own measurements. Here’s the links for D.C./Baltimore, Philly, and NYC. Also, if that’s not enough of a guilt trip, here’s the proper way of measuring snow if you’d like to do a science and help out forecasters during this historic snowstorm. 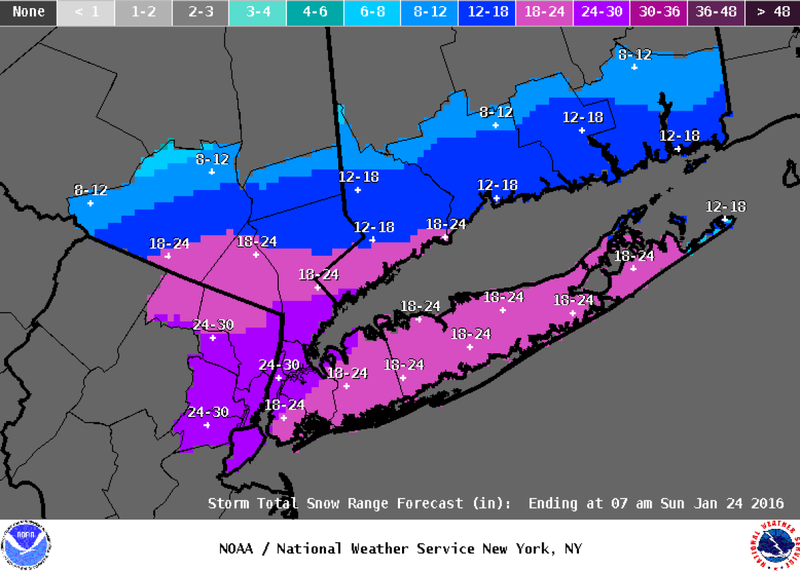 Latest NWS snow map for NYC. 4:30 p.m. ET: Light snow has been falling for a few hours now in Washington, D.C., where the heaviest totals of this storm are expected—but meteorologists a bit further north are beginning to get a little nervous. Today’s last-minute weather models threw fresh uncertainty on just how far north the sharp cut-off of multi-foot snow totals might reach, and National Weather Service forecasters in Philadelphia and New York City have significantly boosted their snow projections in response. There’s now likely to be 20 inches of snow in Philly, up from a range of 12-18 just this morning. 4:05 p.m. ET: Welcome to Slate’s blizzard live blog! I’m your friendly meteorological guide to this storm, Eric Holthaus. (I’ll be posting even more frequent updates on Twitter.) If you’re looking for a broad overview of the storm’s forecast, the link above should do it. If you’re huddled with loved ones around the warmth of your smartphone, well, I wish you luck.